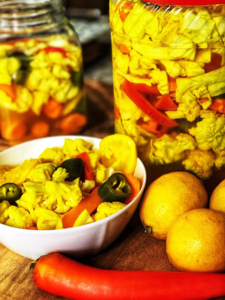 On Pesach, when everything is carb heavy and eating Matzah (with cream cheese and jelly, of course) seems like a full time job, I love to keep a massive jar or two of these pickled veggies around. They are super easy to make and absolutely delicious and ensure that I have an alternative healthy snack to reach for when the chocolate is calling my name. Since they are pickled they also travel well and make a great addition to any packed lunch for Chol Hamoed trips. My family can’t get enough of them and I am thrilled that between all the Matzah and Potatoes, they are enjoying their veggies. Place all the chopped vegetables, hot peppers, lemon slices and garlic cloves in a large, tall, jar. Bring 16 cups of water to a boil and take it off the fire. Add the salt, vinegar, lemon juice and turmeric to the water and mix well so that the salt melts completely. Taste the brine. It should have a nice salty taste and a good vinegar punch. Making sure that the turmeric and salt is well incorporated, pour the water mixture into the jar making sure all the vegetables are submerged. Let the mixture cool, cover and then refrigerate for at LEAST 24 hours before eating. The longer it sits the better it tastes and the spicier it gets. *I used the coarse salt available in Israel which is thicker than Kosher Salt in America. If you are in America, use kosher salt but you might need to add a little more. Taste the brine before adding it to the vegetables. You want to taste the salt but not for it to be overwhelmingly salty. 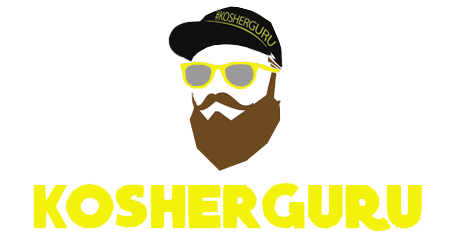 Fagie Reves, is behind the blog of The Gush Gourmet. She is a full time caterer, mom, and wife living in the beautiful hills of Gush Etzion, Israel. From the age of 10, she spent her free time in the kitchen watching her mother cook her famous dishes. Often,she wasn’t allowed to help, but what she has picked up (besides for some secret recipes) was a passion for showing love through food. Cooking with love and then feeding people with the fruit of that labor is a gift. Though her career took a different turn for a while, she always spent her free time cooking, from working summers in one of NY top kosher restaurants to interning with caterers. Eventually her love of cooking, food, and feeding could not be suppressed and made it her full time job. Now, she caters people’s smachot and holiday meals and not only get to provide them with delicious food but to share the joy of their occasions. What does she do when she has a day off from cooking? Shecooks! develops recipes and tries to bring to fruition the ideas she dreams of, and it’s a blast! You can follow her on Instagram @TheGushGourmet and Facebook @TheGushGourmet and find lots of those great recipes on the blog TheGushGourmet.blogspot.com.